Oxford, Maine - Timmy Brackett of Buckfield padded his slim lead atop the Budweiser Championship Series Super Late Model standings Friday night, posting an impressive victory in the 50-lap race topping the Dave's Small Engines/Walker Mowers Holiday racing card at Oxford Plains Speedway. Brackett led the vast majority of the race, breaking a string of disappointing finishes in recent weeks, holding off Scott Robbins of Dixfield to earn his trip to victory lane. Multi-time OPS track champion Shawn Martin of Turner ran most of the event in second position before racing under the checkered flag in third place. Scott Farrington of Minot made a late charge into fourth position, with the top five filled out by Shawn Knight of South Paris. Super Late Model rookie Spencer Morse of Waterford was sixth, followed by Alan Wilson of Hebron, Kyle Treadwell of Buckfield, Dennis Spencer of Turner and Newcastle's Chuck Colby. 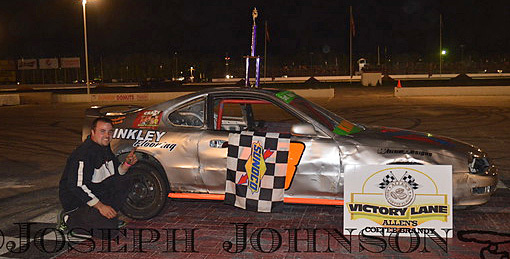 Josh Childs of Oxford cruised to victory in the Allen's Coffee Flavored Brandy Street Stock division, with an aggressive dogfight for other top positions thrilling the large Holiday crowd at the historic Route 26 oval. 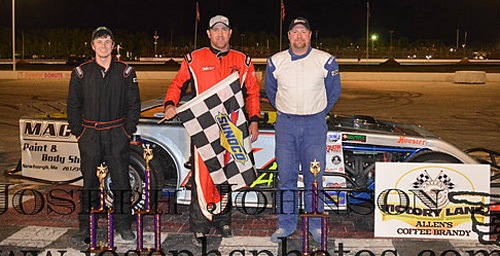 Closest to Childs under the checkered flag was Andrew Breton of Sabattus, who plowed through some late-race chaos to claim runner-up honors in front of Naples competitor Bryce Mains, also surviving some last-lap carnage to earn another trophy. Matt Williams of Brownfield was fourth under the checkered flag, with Norway's Jordan Russell rounding out the top five. Richard Kimball of Mechanic Falls scored his first victory of the season in the 20-lap finale for the entry-level OCS Bandits class. Lapped traffic hindered several of his chief rivals in the race, including runner-up Michael Cleveland of Otisfield, who led much of the race. Points leader Shaun Hinkley of Oxford ended up with a third-place finish, in front of Waterford's Jamie Heath and David Cook of Livermore Falls. Scott Alexander of Newburgh made his long ride pay off, powering his way to victory lane in the 25-lap feature race for OPS Modifieds. Championship contender Ryan Robbins of Dixfield was closing quickly in the final laps, but ran out of time and settled for runner-up honors. Third-generation OPS racer Evan Armington of Lovell finished up in third position, followed by Scvott McDaniel of Livermore and Westbrook's Matty Sanborn. 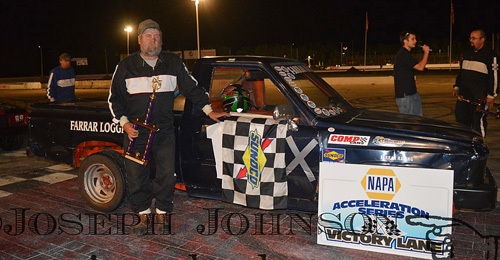 Maine Racing Hall of Famer Jon Lizotte remained undefeated in the Wood Pellet Warehouse Figure 8 15-lapper, but the field is closer to the veteran racer every week. Brunswick's Allen Higgings earned a second straight runner-up finish, with 'Angel Warrior' Mike St. Germain of Auburn third across the finish line. Eric Hodgdon and Zach Emerson rounded out the top five. Lewiston's Corey Morgan outran Steve Moon of Gray in the 20-lap race for Outlaw division competitors. Moon led most of the race before settling for runner-up honors. David Whittier of Poland survived early troubles to earn third-place honors, in front of Michael Haynes of Livermore Falls and Buckfield's Gerry Freve. Dustin Salley of Poland prevailed in a wildly-entertaining 20-lap main event for the Runnin' Rebel division. Salley took command of the race from the previous week's winner, Nathan Dubuc of Lewiston, who found trouble dealing with lapped traffic, as did contender Cam Childs. Salley was chased under the checkered flag by Waterford's Jamie Heath, with hometown Oxford racer Gerard Cote nailing down a third-place finish. Cody White of Buckfield and Auburn's Cody Childs rounded out the top five. 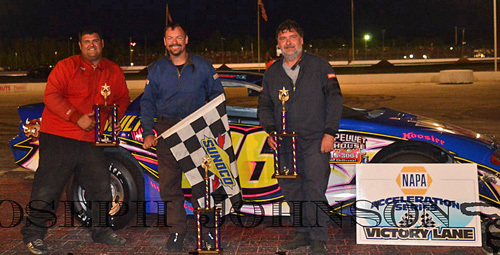 John Childs of Leeds cruised to victory lane following the feature race for Cruiser division racers. Auburn's John Poulin was the best of the rest, with Chase Emerson of Turner filling out the podium. Gerry McKenna of Rumford prevailed in a 15-lap race for the Sport Truck class. Casco's Mark Grantham was a close second under the checkered flag, with Alfred McKenna making a last-lap move to claim third-place spoils. Missy Morgan of Lewiston continued her dominance in the Ladies division, winning the race comfortably over Dixfield's Shelby Shurtleff. Carleigh Vaughn of Naples claimed the third-place trophy. (Finishing position, car number, driver's name, home town). 21 61 TJ Brackett, Buckfield. 12 7 Robbie Wentworth, Center Conway, NH; 13 39 Gerry Freve, Buckfield; 14 04 Zach Bowie, Sabattus; 15 12 Jason Nichols, n/a; 16 17 Gary Davis, Harrison. 6 4 Nik Coates, Turner; 7 2 Randy Sanborn, West Baldwin. 25 51 Kyle Hewins, Leeds; 26 76 Katie McClure, Sabattus; 27 4X Dexter O'Neil, Turner. 6 17 Mike Neddenreip, Bridgton. Outlaws (25 laps) 1 26 Corey Morgan, Lewiston; 2 19 Steve Moon, Gray; 3 81 David Whittier, West Poland; 4 67 Michael Haynes, Livermore Falls; 5 39 Gerry Freve, Buckfield; 6 4 Caleb Emerson, New Gloucester; 7 18 Parker Varney, Windham; 8 2 Dale Lawrence, Lisbon Falls; 9 99 George Haskell, Casco. 22 0 Matthew Mahar, Buckfield. 4 2 Jeremy Decoster, Lewiston; 5 17 William Dunphy, New Gloucester; DNS 14 Shawn Berry, Livermore Falls; DNS 72 Mikel Martin, Auburn. 3 69 Alfred McKenna, Rumford; 4 2 n/a. Ladies (20 laps) 1 26 Missy Morgan, Lewiston; 2 3 Shelby Shurtleff, Dixfield; 3 34 Carleigh Vaughn, Naples; 4 28 Susan Veinott, Greene; 5 29 Shannon Wheeler, Oxford; 6 35 Janice Bryant, Otisfield.